I was thinking of getting a new hair colour and style, maybe a caramel-sepia shade. The hairdressers don't get the style pat down so usually I'll bring along a reference pic. I've been browsing these Japanese sites : Kakimoto Arms Hairstyle book and Rasysa for the latest cutest hairstyles. 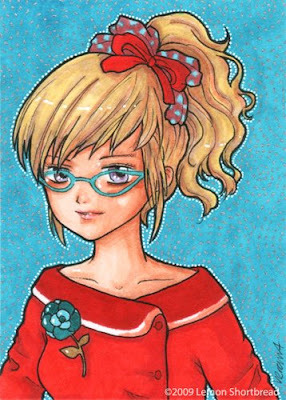 The above ACEO is made with pen, markers and the background is made with a silver pen. Love the sixties so I made her wear an enamel flower power brooch with cat eye glasses! You have such a cute site! This is slightly different to what you normally do and its really nice :) (normally you give it a background picture,flowers etc...).